Ahead of Pope Francis' visit to Abu Dhabi on Feb. 3-5, La Croix spoke with Catholics living in the United Arab Emirates. First of all, forget all our Western representations. There are no old stones, no belfry, no courtyard opening out onto the outside in a church in the United Arab Emirates, but modern building complexes enclosed by high walls behind which Catholic communities bubble with life. This Friday afternoon, for example, it is a festival day at the Saint Mary of Dubai Church. The Filipinos, one of the largest Christian communities in the Emirates, are celebrating the day of the Holy Child, the Child Jesus, an event they inherited from Spanish settlers. In the sun-drenched courtyard, the crowd applaud the dancers in traditional costumes, the children's choirs and the musicians who succeed each other in a joyful din. A few minutes ago, they had been listening to a mass celebrated in Tagalog. The church, which seats close to 3,000 persons, is full. So is the adjoining room, used to accommodate the extra worshippers and there are still hundreds more outside, following the celebration on a big screen. Altogether more than 5,000 persons have come to attend the mass, and it is only one of many scheduled for today. Here Sunday Mass begins on Thursday evening and continues until Sunday, to adapt to the rhythm of Muslim society, where the weekend goes from Friday – the day of the great prayer in Islam – to Saturday. During that interval, about 30 Masses are said. Generally, the parish's statistics appear staggering: 400 lay persons just to distribute communion, 80,000 communicants a weekend, and up to 300,000 for the big festivals. Saint Mary is the only Catholic church in the city, and the number of worshippers is estimated at half a million. On this day, the effervescence reigning in the Church grounds is impressive. As they leave the mass, people rush to take selfies before a cardboard effigy of Pope Francis, as a reminder to churchgoers of his imminent arrival. On the other side of the courtyard, a queue can be seen in front of the kiosk where T-shirts and official caps for the Pope's visit are selling like hot cakes. Yet, "what you see here is a Church of the poor," said Father Tanios Geagea, a Lebanese priest who has been officiating in the parish for nine years now. "Most people earn less than 800 dollars a month," he said. On many occasions, NGOs such as Human Rights Watch have denounced the abuses perpetrated on migrant workers, especially construction and domestic workers. All Christians in the Emirates, estimated at 10 percent to 12 percent of the population, are foreign; so are the overwhelming majority of the inhabitants of the country, where there is no birthplace right. In Abu Dhabi, nationals are estimated to make up about 15 percent, and in Dubai, barely 5 percent. The biggest contingents of Christians are Filipinos, Indians and Pakistanis, way more than Western expatriates. They are the waiters in restaurants, the receptionists or cleaners in hotels, cashiers in supermarkets, domestics in the wealthier houses. In all of the Emirates, Catholics have eight churches, even if new ones are built quite regularly. The most recent one, in Mussafah, not far from Abu Dhabi, was consecrated in 2015. "Of course, obtaining a building permit takes time, but not more than in France to build a mosque," quips Father Michael O'Sullivan, coordinator of the Pope's visit. In a country where more than 200 nationalities live side by side, the small number of churches leads to regular discussions between the different communities. "What we experience here is quite unique," says Father Tanios. "People often speak of the universality of the Church as a theoretical concept. Here we are really living it." This close contact between Catholics also exists between Christians and Muslims. In Dubai as in Abu Dhabi, the church has been built next to a mosque. In fact, in the capital, it is called the Mary Mother of Jesus Mosque. And during mass, you can often hear the call of the muezzin answer the hymns of the faithful. On Friday, you can even hear the priest's homily and the Imam's sermon at the same time. In many respects, the United Arab Emirates are an exception among the Persian Gulf countries. Tradition and Islam mix inextricably with an openness to economic globalization in this young country where, in under 50 years, thanks to oil, the desert has made way for ultramodern high-rise jungles, with luxury hotels and multinationals, surrounded by green parks and spacious highways. But the religious tolerance that the country holds aloft is not the least of its qualities. Here there is even a "ministry of tolerance." Although Sunni Islam is the State religion, the Government shows many signs of openness. Other than the Catholics, many denominations and religions also have their places of worship: Protestants, Copts, Mormons, even a synagogue was recently built in Dubai. 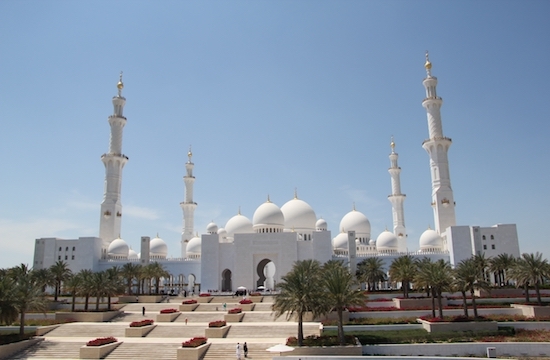 The Hindus have had the right to cremate their dead in the Emirates for many years now, even though the practise is strictly prohibited in Islam. However, this freedom, unique in the region, goes with a strict imperative of discretion, like the churches without belfries or crosses on their outer walls. Seeking converts is prohibited, as are associative activities. For Catholics, this means neither evangelisation nor charity work. While these limits may seem considerable to the outside world, the Christians who live here seem to live with them. "We have freedom of belief and we're free to meet," said one female expatriate. "That's already huge." "As monotheistic believers, we are very respected here," said another. Above all, many see this situation as a sine qua non condition for preserving the calm that reigns in the Emirates. "This country's greatest wealth is not oil," said Father Tanios. "It's peace."